I suppose these medieval and renaissance authors were trying to evoke the "enemy" of Christiandom, i.e. the Caliphate. Thus California has the same "conceptual etymology" as ISIS, via a very different path. "Certified skydiving instructors know way more about safely falling from planes than I do, and are way more likely to die that way." - Randall Munroe, author of the comic xkcd. This quote is the "hovertext" accompanying this cartoon. The original "Captain Jack" was a Modoc Indian, Kintpuash, who is the only person to have killed a US Army General officer during battle - although the Army later executed him for "war crimes," I don't think it's so clear that he was employing tactics any dirtier than the US soldiers were. So in the marching cadence, the soldiers' plan to meet Captain Jack down by the railroad tracks strikes me as an ambivalent situation. Like many US military cadences, there is an anti-military subtext hovering below the surface. I remember decades ago, in some social group or another (I don't really recall exactly which, but I was young), "Captain Jack" was a kind of facetious answer to any "who" question, e.g. Q: "Who did you see there?" "Captain Jack" is also, apparently, an old slang term for heroin or other narcotics - which lends yet another angle of meaning to the popularity of this cadence especially during the Vietnam era. A different version of the cadence is heard in this youtube. Note not just the variation in specific types of "A __-in' man", but the addition of the lines "Re-up? You're crazy! / Re-up? You're outta your mind!" How large is S? Presumably infinite, but what type, among the types of infinity? This song is old, but that Talking Heads Remain In Light album is easily one of my personal favorites of all time. I have never tired of the Talking Heads, since I first discovered them when I was in high school. Talking Heads, "Crosseyed And Painless." I believe this song seems like a kind of prophesy - perhaps an anthem for our new "post-fact" era. The topic of immigration periodically looms in my political imagination. I have never done much about it, however. I once tried to build a website on the topic of "open borders," but my own inertia doomed that effort (the site only lived about a year). I'm pretty sure I wrote somewhere, but I can't find where, that I have sometimes thought that the issue of immigration and open borders will be a new kind of abolition movement. I was gratified to read this post at a blog called spottedtoad, which appears to argue the same idea, more cogently than I ever could. It may fade, but at least at the moment, the issue is becoming more noticeable and more politically polarizing in the US. This is not dissimilar to the way abolitionism took hold of political discourses in the first half of the 19th century. "If they can get here, they have God's right to come." I wrote this exactly one year ago, as a possible blog entry. I never published it in my blog. I'm not sure why - it feels kind of important. I guess I didn't feel it was "finished" and subsequently forgot about it. Now that I'm scraping the bottom of my barrel-o'-blog-ideas, I'll go ahead and throw it down here. Walking home last night [i.e. January 12, 2016], I was thinking about pain and my old, neglected aphorism, "Live each day as if you would live forever." That aphorism worked for me at a time when the only limit to my youthful immortality was my own undying death wish. Essentially, it served as a way to subvert that death wish. But now that there are more threats to my survival coming from outside my mind (i.e. mostly coming from my own treacherous, aging body), I find it hard to maintain the suspension of disbelief necessary to live by that aphorism. Thinking about pain, my thought has always been: if I knew, confidently, that I was immortal, I should think I would find any pain bearable, over the long run. The reason pain is unbearable is because it is a kind of ur-premonition of our mortality. This idea is related to why I always found descriptions of the traditional Christian hell unpersuasive - I always thought, well, if you're there, suffering for an eternity, wouldn't you gradually get used to it? Eventually, after the first few thousand years at the worst, you might even grow to need it - it'd be part of the routine. At worst, you'd develop a kind of asceticism toward it, a kind of zen-like "let it pass through me." To be honest, I would find the idea of actual, permanent death for sinners and eternal life for the saved much more compelling. This is known as the doctrine of conditional mortality - currently held by Seventh Day Adventists, Jehovah's Witnesses and other such peripheral Christian groups. I was experiencing a great deal of pain last January, related to the necrosis and tooth problem which reached a kind of resolution yesterday, as the doctor pronounced my "tooth extraction point" more-or-less healed, despite the necrosis in the jaw. So this seems a very appropriate point to revisit that pain, at its nadir. A nation which makes greatness its polestar can never be free; beneath national greatness sink individual greatness, honor, wealth and freedom. But though history, experience and reasoning confirm these ideas; yet all-powerful delusion has been able to make the people of every nation lend a helping hand in putting on their own fetters and rivetting their own chains, and in this service delusion always employs men too great to speak the truth, and yet too powerful to be doubted. Their statements are believed – their projects adopted – their ends answered and the deluded subjects of all this artifice are left to passive obedience through life, and to entail a condition of unqualified non-resistance to a ruined posterity. [emphasis added] - Abraham Bishop. Bishop was an American Jeffersonian politician (called "Republican" in that Era), abolitionist and orator, who lived 1763-1844. He apparently advocated for gender equality, too. Oddly, the wikithing lacks an article about Bishop, but I found this with some biographical information. "I dream of a world where chickens can cross the road without having their motives questioned." In a candy shop in Oldtown Pasadena about 9 days ago, where we had stepped in because my nephew Dylan had a sweet-tooth, I ran across the above joke, inscribed on a fridge magnet, for sale for the ghastlily exorbitant price of $6.50. I laughed very hard. So did my dad. My sister just made a face - the kind that says, "I can see why you would find that funny but I don't plan to laugh." I bought two of them, but the phrase was already inscribed on my brain. Curt, who'd witnessed all this, was unable to understand the humor. Of course, there are lot of cultural touchstones that make it inaccessible to those not grounded in US culture. I have been trying to think about how best to explain to Curt why this joke made me laugh so hard. I think the first step is to begin to fill in some missing cultural components, with a disquisition on the ancient "Why did the chicken cross the road?" joke genre. So, let's begin. There is a question-and-answer joke, that asks, "Why did the chicken cross the road?" The oldest, most time-tested answer is, "To get to the other side." There exists an infinite number of alternate versions, with questions and answers. Many of the versions rely on the "build up" of previous versions (e.g. #10, below). I researched a few that I found most humorous. The next step is to recognize the new joke's nod to another genre altogether: the "I dream of a world where. . . "
Somehow, my feeling is that this is rooted in the Langston Hughes poem. Or, if not rooted there, then nevertheless Hughes' poem is an early peak of a meme. So another aspect of the joke's appeal, at least to me, is that it takes the silly chicken joke meme and combines it with the high-register "I dream" meme. Finally, the last part of the joke, which renders it especially appropriate for me, is the bit of psychobable at the end: ". . . without having their motives questioned." This is a type of language popularized during my parents' generation, and echoes the whole "I'm OK, You're OK" meme of that era. There's a lot going on in that joke. I have placed it on the sidebar of my blog. I recently read a review of a book (The Kingdom of Speech, by Tom Wolfe) I was already uninterested in, based on other mentions of it on various linguistics-oriented blogs. The book has received a huge amount of attention in the mainstream media as one of those books on "linguistics for non-linguists," and apparently contains an attack on Chomsky's approach to linguistic universals, and challenges the importance of his contributions. It also, incidentally, attacks Darwin. So there's that. I'm no huge fan of Chomsky, but it's not his theoretical work that has annoyed me so much over the years, but rather his "armchair anarchism," and the seeming hypocritical disconnect between his anti-authoritarian politics and his somewhat dogmatic (i.e. authoritarianish) and unquestionably totalizing approach to his field of specialization (syntax). How does a self-avowed anarchist not see the irony in dogmatically propagating a theory with the a Foucauldian title like "government and binding"? Nevertheless, and setting aside his academic dogmatism, Chomsky's insights to the field of syntax were revolutionary, and even if they are increasingly being called into question by other linguists, he deserves his reputation. His work has been foundational. Therefore the review is right on target. It rightly defends Chomsky's intellectual legacy, which regardless of the weaknesses of his forays outside of syntax, should be secure. I recently ran across the concept of "epistemic vice." In the first instant, I found the approach appealing, but it quickly lost its luster as I examined it more critically. Like other "virtue/vice" systems, it has a weakness, which is that it sets up a moral judgment on something that should be approached objectively, at least in accordance with my own ethical intuitions. In fact, there's a particular problem with the concepts of epistemic virtue and epistemic vice, which is that, if you look at things at a more "meta" level, the paired concepts themselves ought to be condemned as instances of epistemic vice, under the latter's definition: it is an act of leaping to a judgment of a person's behavior (specifically, the holding of epistemic beliefs, which is a sort of behavior) without considering alternatives. To say "close-mindedness is a vice and not a virtue" is itself a kind of dogmatism, and the act of a closed mind. The whole thing swallows its own tail, ouroboros style, and thus fails. The mind is finite. Therefore there exists some finite number of possible states of mind - a large number, surely, but definitely not infinite. That being the case, and taking a deterministic view, there will be some number of series of states of mind that entail closed loops of various sizes. So imagine a certain state of mind that inevitably leads back to itself in a fairly short amount of time - i.e., within a single human lifetime. Is it possible someone has ever experienced this? Entering a state of mind that, after some amount of time, repeats. Is this what the mental experience of "deja vu" is? Is a true repetition impossible, due to outside inputs? What if the person were in some kind of sensory deprivation tank? What of people who are "locked in" due to various neurological conditions? Perhaps in that kind of situation, what if it turned out that the mind looped fairly regularly? This is a fascinating article: a German historian has demonstrated incontrovertibly that Hitler was a serious drug addict. I actually had never heard about this before, but it looks like it has been one of those "open secrets" among historians. I find it very compelling. The idea that Hitler was a coke-head junkie in his last years has a lot of explanatory power. And not just Hitler - the whole damn Nazi military apparatus was apparently high on meth and coke, with the pushers being the government. A bad trip, indeed. What other 20th century insanities might be better understood as drug-related issues? I don't actually currently have with me either of the books, The Dispossessed by Ursula LeGuin, or Atlas Shrugged by Ayn Rand. Yet over the years, I have found myself recalling both books frequently in my meditations on philosophy and the nature of human societies, although until just now, never really at the same time. I had a very weird epiphany, the other day, however. In my mind, anyway, these books are actually in the same category. Most thinkers would be alarmed by this suggestion, I imagine. LeGuin and Rand are hardly philosophical comrades-in-arms. Both books, thematically, are about utopias. In fact, both are about flawed utopias, though the flawed utopia of each one is the dystopia (anti-utopia) of the other. Yet both tread the ground of the conflict between the two topias. Both authors influenced me hugely in my own thinking about utopias and intentional communities of all kinds. My epiphany is "incomplete" - I need to work through how these books connect. They may even be in a kind of accidental dialogue. Interestingly, my curiosity prompted a quick googlesearch, which revealed to me that LeGuin has explicitly claimed she was NOT influenced by Atlas Shrugged. This is almost humorous, in light of my epiphany. It makes me want to try to prove otherwise. If LeGuin read Atlas Shrugged, as she admits, then it suddenly becomes inevitable, in my way of thinking, that there must be some influence, if only that LeGuin is writing against Rand. I am recalled to mind of critic Harold Bloom's influential work, The Anxiety of Influence. If I had the texts in front of me, I would be tempted to re-read them in parallel and find out what relations might exist. Maybe I'll purchase copies on my next trip to the bookstore - I heard there's a new Kyobo Mungo store at 백석, a much closer trip than heading into Seoul - the Kyobo Mungo outlets there form my main source for English-language books. A few weeks ago I finished that book my friend Peter loaned me - Hendrick Hamel's Journal. Essentially, I read it in one sitting - it's not a long book. Peter guessed correctly that the parts I found most interesting were the appendices and footnotes. In general, however, it reads pretty well - it is a remarkable gateway to a truly alien world: a 17th century Dutchman stranded in an even more alien 17th century Korea. Yet I was impressed his remarkable equanimity and his refusal to categorically condemn his captors (indeed they made him a slave, which was the typical fate of foreigners landing in Korea in the period). 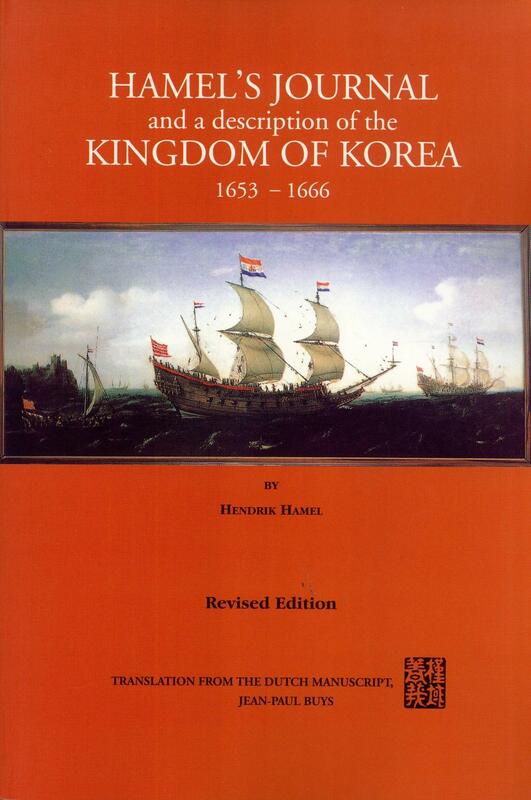 I recommend this book even to those without a specific interest in Korea. In some ways, the narrative most resembles those "stuck on an alien planet" tropes common to certain types of science fiction. That, in itself, makes it quite fascinating. I have often joked that in my long-term residence in Korea, I have "emigrated" to one of those alien planets that so fascinated me when I was younger. This book captures the same idea. Korea of the present day is hardly alien at all, compared to the Korea of that era. Recently, the term "neoliberalism" seems to be undergoing a kind of evolution. In the past half century (i.e. during my lifetime), "neoliberalism" seems to have been a negative term used by people, mostly on the left, to define an opposition they don't like. Lately, however, some people have been trying to "reclaim" the term as defining their own position. Interestingly, I find this redefinition somewhat appealing. It seems to be a kind of "liberalism with libertarian tendencies" and/or "libertarianism with liberal tendencies" which actually hoves somewhat to where I am, politically, myself. One recent self-identified "neoliberal" that I ran across is Sam Bowman (I don't really know who that is - some economist maybe?). For the most part I am close to that defintion. Interestingly, I think Hillary Clinton is, too. Many Bernie Sandersites have called Clinton "neoliberal" despectively, but in fact, she might call herself neoliberal if identifying with Bowman's definition. I think what Bowman leaves out entirely, but which is critical to my understanding of both the historical conception of "neoliberalism" as well as why I think I don't quite match the concept, is on the issue of militarism and/or interventionism. I am not a pacifist, but I am not really in favor of militarism, even the "trying to save the failed-state-du-jour" variety common nowadays. My biggest disappointment with Obama and biggest ambivalence about Hillary Clinton is in this realm. I think that this lacuna with respect to militarism in historical neoliberalism is its overlap with what was called "neocolonialism" when I was vaguely marxist, in college. And just as then, when it comes to such things, I am very much anti-interventionist. If I stick only with Bowman's defnition, I could be a neoliberal. But I refuse the term because of that unmentioned neocolonial affiliation. Both traditional liberals and traditional libertarians would also be unconfortable with it, I think. I am tired from work last week, so I will simply offer the answer to the question, "what is the purpose of life?" "The purpose of life is to hydrogenate carbon dioxide." - Mike Russell, Scientist at JPL. Although I like the poetry, and in some ways I can appreciate the concept, too, I find this portrait of God deeply unsympathetic. Of course, as CS Lewis has observed, we're not supposed to like God, are we? That's not really the point. In a similar vein, I have always found the gnostic portrait of the creator God (i.e. of the Pentateuch) as an enemy of humanity compelling - a view which perhaps was more integral (implicitly rather than explicitly) to pre-modern Christian views of God, as suggested by the above poem. Anyway my own view remains that I appreciate all these stories as strong metaphors, but I remain militantly anti-transcendentalist. Jimmy Driftwood, "The Battle of New Orleans." Driftwood was a history teacher who made this song in 1959 to get his students interested in history. I remember hearing the Nitty Gritty Dirt Band version in the mid 70's, and I admit, it got me interested in history. I'm not sure about the over all accuracy - especially the issue of how the American soldiers used the alligators. But anyway it's actually a pretty funny song, and from the start I was fascinated by the unusual language in it, as well - perhaps it also got me interested in dialectology. Lyrics - I found them online, but the sung lyrics differed somewhat, so I have made some alterations based on what I hear, to match the actual non-standard language being used, e.g. the published lyrics have "they begun a running" but the singer clearly says "they beginned a-running." He's a-gonna whip the britches off of Colonel Packenham. Then we opened up our squirrel guns and really gave 'em hell. (비유적으로) 잠깐 만났다가 곧 헤어지다. 천둥같이 만났다가 번개같이 헤어진다는 뜻에서 나온 말이다. "(Figuratively) Although a moment is met, it soon divides. The saying comes out meaning that although thunder meets, lightning divides up." I guess this would refer to the philosophical conundrum of the ephemerality of the "present." I spent a major portion of my morning reading most of the entire series of comics posted at the site existentialcomics.com. I don't know who the author is or much about why this comic exists. But I found it all quite entertaining, and I laughed many times. This kind of humor is not accessible to everyone, I know. 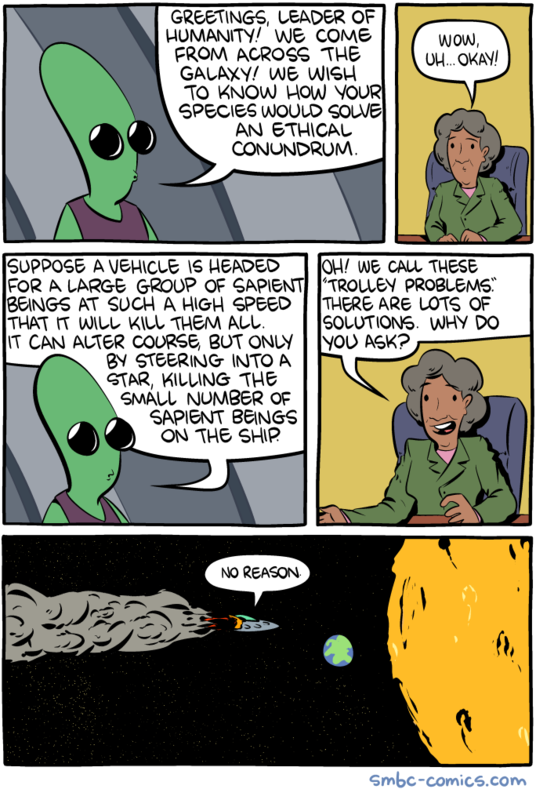 The title for this blog post comes from a comic about the philosopher David Hume, serving as captain of the Starship Enterprise. He meets his nemesis, Kant. This doesn't go well, as we can predict from the original story. Everyone that confuses correlation with causation ends up dead. This was interesting, especially the way the story kept "branching" out from the original effort to explain the Zipf phenomenon. This is the the kind of thing I like to think about, "for fun." I liked the Emerson quote near the end, but, I am unsure if it is truly his. Wikiquote says it's "unsourced," whatever that means. "I cannot remember the books I've read any more than the meals I have eaten; even so, they have made me." - Ralph Waldo Emerson. "What has 34 legs in the morning, 69 at midday and 136 in the evening? A man who collects legs." I have no idea why I found it so funny. If you know why I found it so funny, let me know - it may provide deep insight into my dysfunctions. Actually, on further reflection, I think the fact that it was under the specific heading that it was under influenced my reaction - which it to say, the heading "Non-Gricean" primed my mind for the subsequent punchline, which would not have had the same "punch" if it had not been primed by the heading. Of course, that means finding the joke funny relies in part on knowing something about Grice's work in linguistic pragmatics. Relatedly, but at a deeper level, I recently was granted an insight into the nature of humor while reading a kind of throwaway article at The Register (an IT-based humor-plus-news website) by Tim Worstall (who deserves credit). He was writing about some kind of google-translate-related disaster at a Moravian tourism website. But he said, in an aside, "I might even advance a theory of linguistics where our delight in such puns is in itself a reinforcement mechanism to make us think about those multiple meanings possible." Our delight in puns and jokes is an evolutionary adaptation which is rooted in a feedback-based reinforcement of the cognitive mechanisms that allow us to cope with polysemy, which in turn is at the basis of abstract thought, metaphor and hypothesizing. Some criticism has been leveled at Barack Obama, over the years, for being a perhaps excessively cerebral president. I understand such criticism, but I cannot wrap my head around the vernacular American resistance to the idea of an intelligent president - this is a problem that has puzzled me since my youth. "Everybody wants to talk about hypotheticals; there is no such thing as a hypothetical"
Let me present a hypothetical: are we now ready for a president who is not only anti-intellectual (a la Reagan) but who a priori denies a capacity for abstract thought? We like to think of the "drug epidemic" is something that emerged in 1970s and 1980s. We like to think there aren't deep and complex cultural roots to the relationship between drugs and violence and disadvantaged social classes, and that those roots antedate the "War on Drugs" by many decades. I wonder to what extent the "War on Drugs" wasn't a kind of "redirection" of repressive energies vis-a-vis the civil rights movement. The former ramped up alongside the latter, and served as a kind of coded means to continue social control while paying lip service to the ideals of equality. Luke Jordan, "Cocaine Blues." 1927. Really - this recording is older than my dad's car. Dealin' with the furniture man? The doctor swore, "I ain't gonna sell her more." Luke Jordan, "Pick Poor Robin Clean." 1927. Oh, didn't that jaybird laugh when he picked poor robin clean?